Ok. So as of 6/10/2014's market close the SPY was 195.6 and the VIX closed at a ridiculous recent low of 10.99. Now because the VIX (IV) is the implied volatility of 1 month contracts on the SPX and because this 1 month figure is quoted annually, we take the current value of the VIX and multiply it by sqrt(20/250) to convert it to a true monthly figure. So given a VIX of 10.99, the SPX a 1stdv move to the upside and downside will be 195.6(+/-)10.99*sqrt(20/250)*195.6, ie, 201 and 189 on the SPY, 1 month from now. If it goes above 201 or below 189, the move is greater than a 1stdv move. So I ran a historical test to see how close the SPX has abided by the VIX, 1 month prior. 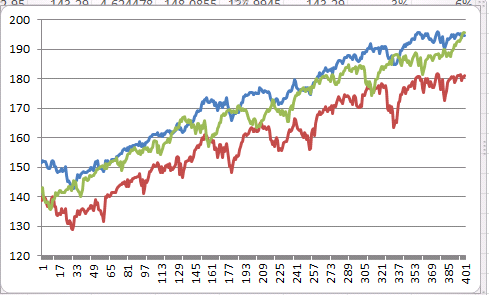 So I ran a historical test from 1/2/2001 to 6/10/2014, on daily data of the SPY and the VIX. Because I lose one of month of VIX data because due to the forward lag, we have a sample size of 3358 days. The 1st number is the days above the upper stdev band The 2nd number is the days below the lower stdev band The 3rd number is the total # of days beyond nth stdev by the normal distribution. From the results it seems that the market is more normal that we actually though. But other empirical evidence has shown otherwise. From the results I am seeing, It seems to suggest equity prices are normally distributed. We don't see more fat tailed events more than the normal distribution suggests. Can someone shed light if I ran the analysis incorrectly?? Not the answer you're looking for? Browse other questions tagged implied-volatility spx standard-deviation or ask your own question. Could the Implied Volatility distribution change again?